I have been obsessed with white beans as of late. No explanation…I just want them, all the time. Also, tuna. No idea why. Luckily, Smitten Kitchen delivered and we whipped up this dish for dinner last week. She mentioned that it makes enough to feed a couple starving armies…so we halved the recipe and still had plenty of leftovers for lunches during the week! Pulse onion, carrot, celery, whole garlic cloves, parsley, and red pepper flakes (to taste) in a food processor until finely chopped. Heat 4 tbsp. oil in a large, heavy pot over medium heat and add vegetable mixture to pot. 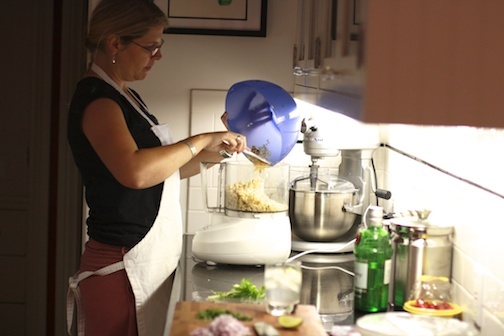 (Quickly rinse, but no need to fully wash, food processor as you’ll use it again shortly.) Season generously with salt. Cook, stirring from time to time, until vegetables take on a bit of color, about 10 minutes. Add tomato paste and cook it into the vegetables for another minute. Add 1 cup water and use it to scrape up any bits stuck to the pot. Let simmer until liquid has almost disappeared, about 5 to 8 minutes. Add beans and 2 more cups of water to the pot and simmer until the flavors meld, about another 15 minutes. Meanwhile, cook pasta until al dente, or still a little firm inside. Reserve 1 1/2 cups cooking water from your drained pasta. 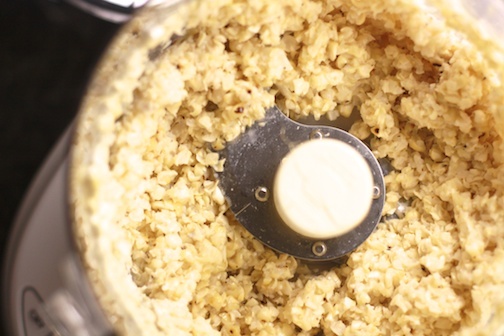 Transfer one cup of the bean mixture to your rinsed food processor and purée it until smooth, then stir it back into the sauce to thicken it. 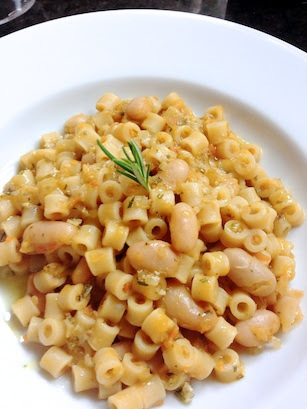 Add drained pasta and 1/2 cup cooking liquid to bean sauce and cook the mixture together, adding more pasta cooking liquid as needed, until the sauce coats the pasta, about 1 to 2 more minutes. To serve: Heat remaining 1/4 cup olive oil in a tiny saucepan over medium-low heat with garlic and rosemary, until sizzling stops. Divide pasta between serving bowls and drizzle garlic-rosemary oil over each. Next time we make this, we will wait until the very end to add in most of the beans as we found that we liked them a bit toothier and less mushy. And please, don’t underestimate how critical the garlic rosemary oil is at the end. I would even recommend making more of the oil for leftovers and dredging some crusty bread through it. 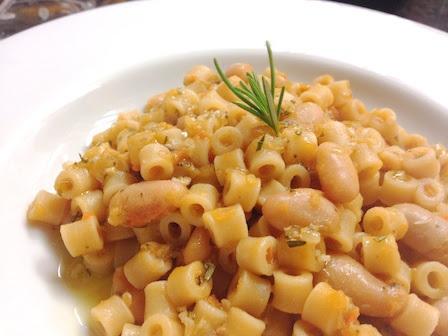 This is a great vegetarian hearty and filling dish despite looking a little bland. Who knows, next time I might go crazy and throw some lightly dressed arugula on top! I know that it is now, technically, October…however, Los Angeles is not behaving that way and therefore I feel completely justified cooking like it is still seriously summer…as in triple digits! 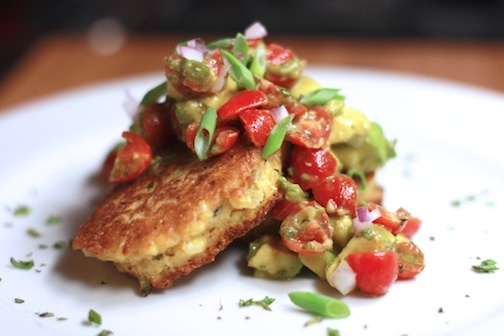 Also…I wasn’t joking when I said we have been on a serious corn and tomato kick – and this recipe uses both! I first stumbled on this recipe through Pinterest (you can follow @lizfisch) and then I happened to have everything in the house to whip up a batch. The best part is that the source of the pin is easy to find. Thanks to EzraPoundCake for posting the recipe, which actually comes from “Sara Foster’s Southern Kitchen“. I made a few changes to the recipe from EzraPoundCake, including roasting the corn before shucking and not adding any jalapeno peppers (didn’t have any on hand…and as previously discussed…I can’t take the heat!) 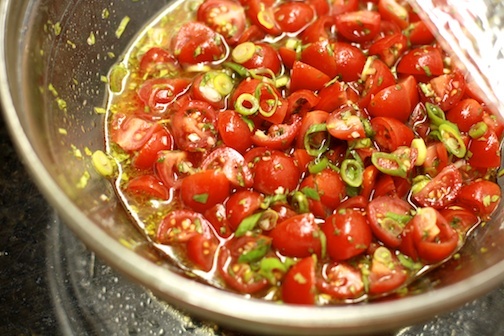 to the tomato salsa. Preheat oven to 200 degrees F. Line a baking sheet with a brown paper bag or paper towels. 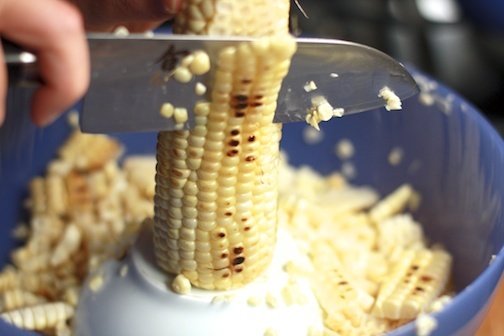 Cut the corn from the cobs into a large bowl, and scrape the stripped cobs with the back of the knife (or a spoon) to release the juices into the bowl. I find the easiest way to do this is to set a small bowl upside down in a larger bowl and use the smaller bowl as the base for the cob. The kernels tend to fly all over the place as you are cutting them off and you can maximize the stability of the cob while also catching the majority of the kernels. Place 2 cups of the corn kernels into a food processor, and pulse several times, until the corn is slightly puréed but still chunky. 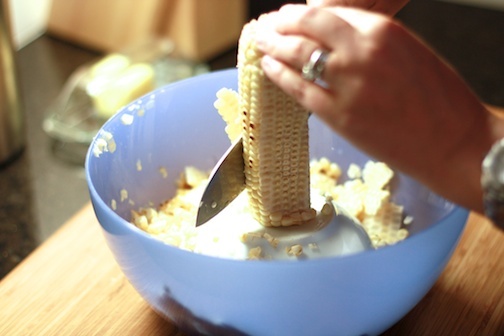 Scrape into the bowl with the remaining corn kernels. 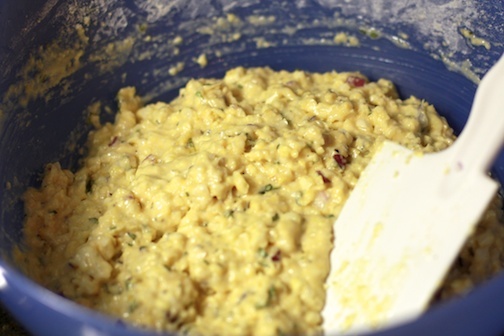 Add flour, cornmeal, onion, basil, baking powder, baking soda, salt and pepper to the corn. Stir to mix. Place a large skillet over medium heat. Add just enough canola oil to barely cover the bottom, and heat until sizzling hot. 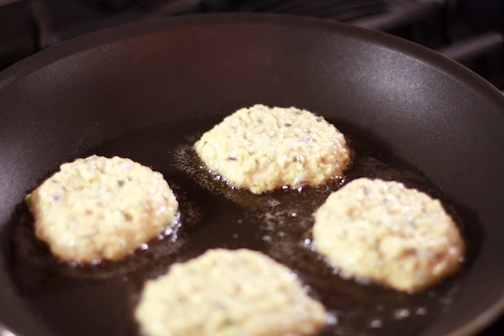 One heaping tablespoon at a time, scoop the batter into the skillet. Cooking in batches of 4 to 5 to avoid overcrowding, fry the cakes 1 to 2 minutes per side, until golden brown. Drain on the lined baking sheet, and place in the oven to keep warm while cooking the remaining corn cakes. Serve warm topped with a heap of Chopped Tomato and Avocado Salsa. 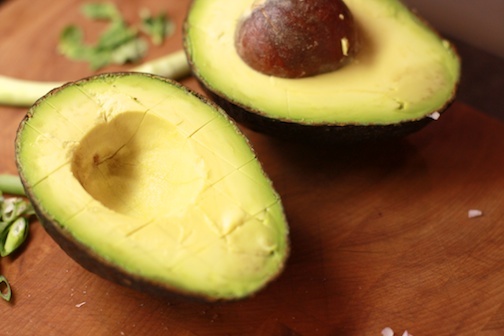 Place all of the ingredients (except the avocado) in a bowl, and stir to mix. Refrigerate in an airtight container until ready to serve, for up to 2 days. Just before serving, add the avocado, and mix gently. 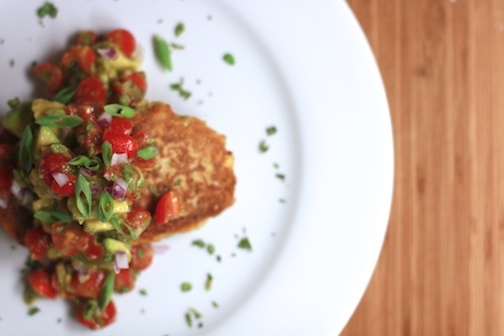 Once you’ve got everything ready to go, stack two corn cakes on a plate and top with salsa, garnish with more of the freshly chopped herbs, sliced scallions or minced red onion…any or all of them will do. Anyone still hanging onto summer favorites out there? Anyone…? Bueller…? Okay, I’ll make a promise…I’ll move on to fall dishes, as soon as the LA cools off a bit…I’m not asking for much…let’s say, highs in the 70’s? Until then, I consider it summer! Trim the asparagus, toss with olive oil, salt and pepper and roast for 10 minutes at 425º. I like to roast my beets. Give ’em a quick wash, pierce a few times with a sharp knife and then wrap in foil – as a bonus you can drizzle them with olive oil and a sprinkle of sea salt. Roast in a 375º oven for 25 minutes to an hour depending on the size and quantity of beets. Smaller and fewer, shorter amount of time. Let them cool once they are done and then the skin should slip off, or you can use a knife to peel off the skin. Quarter, drizzle with olive oil and/or vinegar and top with fresh goat cheese. Serve with crusty bread! We have had an abundance of sweet potatoes this winter. I’m okay with this. I love sweet potatoes. Usually, we poke them with a fork, and throw them in the microwave until they are ‘baked’ and cut a cross in the top, pinch the sides, mush up a bit with a fork and then top with salt, a pat of butter, and maybe some chives or other fresh herbs. Nothing more is necessary. I decided to mix things up a bit. Dice the sweet potato into ½ inch cubes. A simple way to get an (almost) perfect dice is to start with peeled potatoes, slice them lengthwise, then lay flat to cut strips. Rotate 90º, and cut into small cubes. Next, slice up some onions. 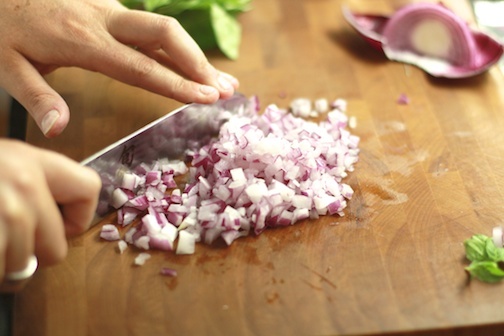 Now, usually, I’m a believer in cutting ingredients in a dish into similar sizes – this can be important for cooking times, texturally important and visually important as well. Except, there are always exceptions. I sliced the onions (rather than a dice) for all of the same reasons mentioned above. 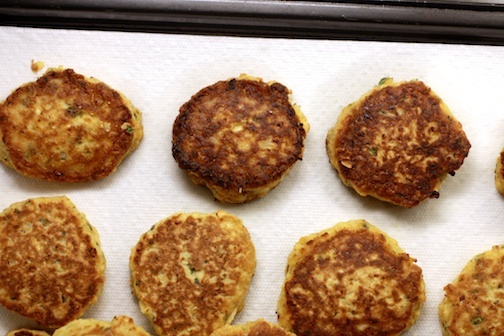 With such a simple recipe…the difference in texture and variety of size does more for the dish. Toss it all in a sauté pan with a fat of your choosing (bacon fat, olive oil, butter…it’s up to you) and shake to coat. You want the sweet potato to brown, and then onion to soften so keep the heat on medium. If it’s browning too much, but the veggies are not tender, add a little broth or water to help steam and let it evaporate to bring back some of the caramelized goodness! Season well with salt and pepper. Now it’s time for the cumin, one of my all time favorite spices. 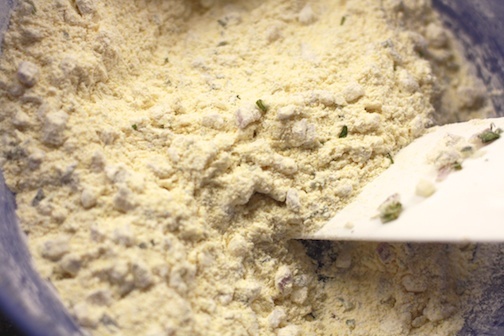 Sprinkle in up to a teaspoon of ground cumin…the aroma should soon fill your kitchen. I added a twinge of oregano as well. In the meantime, or the day before, or whenever. Cook up some wild rice. I’m lucky enough to have a Minnesota source for real wild rice…and let me tell you…it is worth the extra effort and the extra cost to find the real, true WILD rice. The wild rice grain comes from a long-stemmed grass that grows in shallow lake waters or slow-moving streams and was/is typically harvested by Native Americans in canoes by bending the stocks over an open canoe and whacking the grass to knock the grain out. It can take close to an hour to cook, and if added to a soup will continue to soak up liquid…the next day, you might look in the fridge for leftovers, and be confused when instead you find a thick and hearty stew. Not to worry, a little stock or milk will thin it right down. Soaking up liquid isn’t an issue for this dish, but you will want to make sure that you have cooked the rice to your liking. I like it a little toothy still. 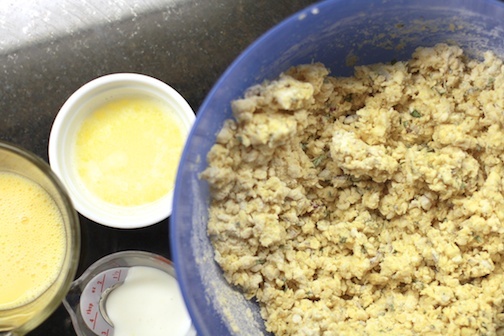 Throw it all in one big bowl together…and mix well. Make sure to taste for seasoning again…adding all that rice will require some additional salt and pepper, and maybe a bit more cumin. This was one of many dishes (our contribution to a potluck) that we enjoyed alongside a wild-shot, home-smoked and roasted goose. Delicious all around!